I have a ton of work to get done over the next couple hours so don't have much time today but thought I would take a quick break and post a blog. Lola has developed a new obsession for shoes. I'm not saying this is a good thing but I have to say she comes by this honestly as I too love shoes. I was just thrilled when I found these adorable shoes at the Gap. When Lola got home yesterday I was ready to try the shoes on her to make sure they fit and they fit like a glove. Then I put them back in the shopping bag so I could hide the purchase from Clay (he says she has too much stuff...I don't know why he thinks this) and thought I would phase them in slowly and maybe he would never notice. Well, Lola wasn't having that. She threw one of her little fits and kept saying "Want shoes on, Want shoes on, Want shoes on". I tried to put an old pair on her and she didn't want them. She only wanted her new little pink patent leather shoes. At that point, I let her wear them and she absolutely LOVED them. She kept saying "walk outside" over and over. So, we went for a long walk outside and she just pranced up and down the street in her new shoes. Then, this morning I was looking for her sandals everywhere but couldn't find them. Well, Lo took it upon herself to go into my closet where the shopping bags were hidden, pulled out the Gap bag, pulled out her brown tennis shoes and once again shouted "Want shoes on, Want shoes on, Want shoes on" and she did this right in front of Clay...exposing my purchase. Man, I'll have to work on her there...she needs to learn to be inconspicuous about some things...right??? Anyway, once again, she thought she was "Miss Thing" prancing around in her shoes. She couldn't wait to get outside to try them out. Clay loved them too! 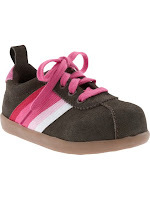 Look how cute these shoes are that I found on my new fav shoe website - http://www.littlemonkeytoes.com/. I love them! The problem....well, they are $119....Seriously! 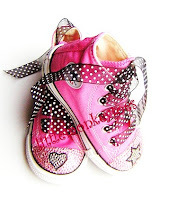 But, I have a solution, my mom is going to buy some converse and we're going to try to make some ourselves. They will be cute, cute, cute!!!! I bet they'll even be cuter than these...can't wait!Oh, we try not to spoil the little girl but sometimes it's hard when it comes to shoes (and maybe clothes too...I'll save that for another blog)!